In our modern society, it seems to be getting harder and hard for the average American to afford the rising costs of medical care. Inflating prices for medical products and services are on the rise, placing more pressure on both the insurance companies and the citizens they cover. One method that many employees utilize through their employer-sponsored program is a high-deductible plan. This choice is ideal for individuals who are in a good state of health and require little to no medical attention on an annual basis. If you suddenly find yourself in need of diagnostic medical imaging services, this insurance plan can quickly become burdensome. North Pittsburgh Imaging Specialists is proud to be your source for affordable imaging in Pennsylvania. For years, we have dedicated our practice to become Pittsburgh’s imaging service specialists, relying on our American College of Radiology (ACR) certification and a trusted team of experts to deliver affordable outcomes for your medical needs! Lower premiums are very attractive for many people, but this lower monthly cost comes at a price — a higher deductible. Patients with high deductibles rarely meet the amount required for their insurance to step in and cover the rest. If you have a $2,500 deductible, for example, you may be liable for 100 percent of your medical costs until you reach this amount. Once you hit your deductible, your provider will likely provide coverage for a certain amount, such as 80 percent of future costs for the calendar year. While hitting your deductible can result in major advantages when it comes to diagnostic imaging or durable medical equipment, it can prove to be very burdensome to pay for your services up until this threshold. Our top priority here at North Pittsburgh Imaging Specialists is to provide the highest level of personalized care at prices that our patients can afford. We always have a board-certified radiologist on site to address any questions or concerns you have about your imaging services. Not only do we rely on modern technology and a quality team of experts to deliver Top Rated Local® medical imaging, but our proven services can also help to save you hundreds of dollars of your hard-earned money. Coming in for diagnostic imaging can be a stressful experience. Our team is here to help you every step of the way, delivering comprehensive care to give you the best tools to prepare for whatever the future may bring. 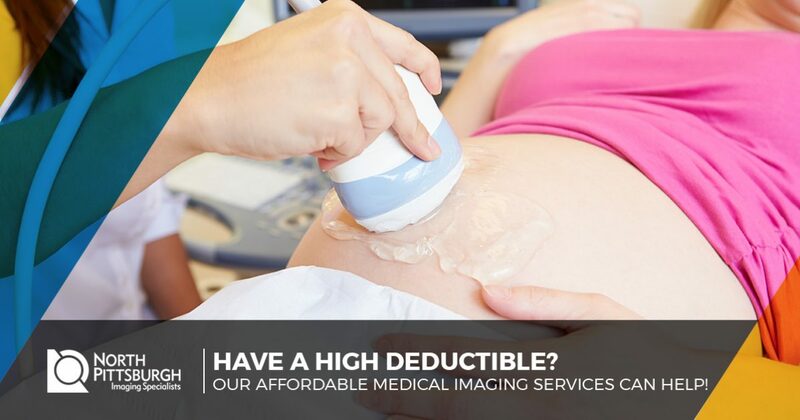 Instead of paying an exorbitant amount for medically necessary imaging or placing your trust in the hands of providers who are affordable yet unqualified, turn to our imaging experts. We are proud to provide Pittsburgh affordable imaging services. Contact us today to learn more or fill out the form below to schedule your appointment today!